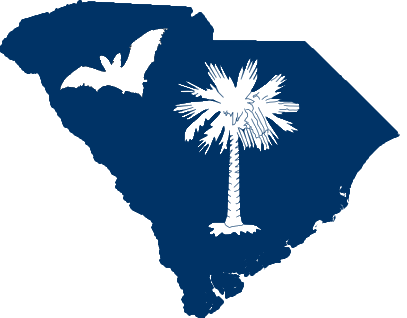 I have learned that they are one of the most diverse Mammalian groups and compose a quarter of all mammals, that we have less than 20 species in South Carolina but that SC bats, like most bats, eat moths, mosquitoes and beetles. The very ones that plague us for our blood and our food crops. Bats have been the silent but scorned helper to our agricultural industry for as long as we have planted crops. They contribute over $10 billion of pest control services per year to our farmers in the US and over 100 million here in SC. I can’t guess what they contribute to the world in pest control and pollination and seed dispersal services. I have even heard that bats were good for defense…apparently soldiers made gun powder out of old bat guano during the civil war. I can’t swear that is true but I do know my great grandfather bought, sold and used hundreds of tons of guano on his wheat fields early in the 20th century after cotton farming of the 19th century had utterly depleted fields of nutrients all across the south. For no other reason than this; That our small SC native Little Brown Bat (Myotis lucifugus) can individually eat over a thousand mosquitoes in an hour, I have grown to love bats. The more that I have learned about bats the more that I have learned how much we needed them and I have come to learn further how much they needed us. I learned that many species of bats in North America have become infected with an invasive fungus from Europe and Asia such that nearly ten million bats have been figuratively killed in their sleep (while hibernating). The fungus Pseudogymnoasus destructans manifests as a white growth on the nose and wings of hibernating bats and disrupts hibernation and these small warm blooded animals quickly die without the insects of summer to sustain them through freezing temperatures of winter. Many hibernating species like most myotis will not likely survive this newly introduced cold loving fungal disease … so called White Nose Syndrome (WNS) to North America. It was devastating to me to find this out at the same time that I had begun to really love bats. It is like getting a new best friend and finding out that they only have a few years to live.